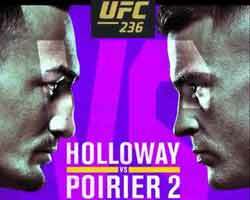 Review: 2013-03-02, good pace and nice exchanges between Nietes and Fuentes: three stars. Donnie Nietes (31-1-3) entered as the No.6 light flyweight in the world while Moises Fuentes (16-1-0) entered as the No.7 minimumweight. 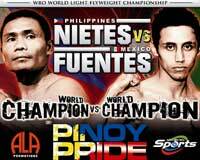 Nietes vs Fuentes is valid for the WBO light flyweight title (Nietes’ second defense); they also faced each other a second time on May 10, 2014 (=Nietes vs Fuentes 2). Watch the video!